RHC Summer Nightstand Event | What's On My Nightstand? During the summer “What’s on Your Nightstand” event at the Skokie campus, the following books were discussed. “1878 Paris. Following their father’s sudden death, the van Goethem sisters find their lives upended. Without his wages, and with the small amount their laundress mother earns disappearing into the absinthe bottle, eviction from their lodgings seems imminent. With few options for work, Marie is dispatched to the Paris Opéra, where for a scant seventeen francs a week, she will be trained to enter the famous ballet. Her older sister, Antoinette, finds work as an extra in a stage adaptation of Émile Zola’s naturalist masterpiece L’Assommoir. Marie throws herself into dance and is soon modeling in the studio of Edgar Degas, where her image will forever be immortalized as Little Dancer Aged Fourteen. There she meets a wealthy male patron of the ballet, but might the assistance he offers come with strings attached? Meanwhile Antoinette, derailed by her love for the dangerous Émile Abadie, must choose between honest labor and the more profitable avenues open to a young woman of the Parisian demimonde” (Descriptive content provided by Syndetics). “Coralie Sardie is the daughter of the sinister impresario behind The Museum of Extraordinary Things, a Coney Island boardwalk freak show that thrills the masses. An exceptional swimmer, Coralie appears as the Mermaid in her father’s “museum,” alongside performers like the Wolfman, the Butterfly Girl, and a one-hundred-year-old turtle. One night Coralie stumbles upon a striking young man taking pictures of moonlit trees in the woods off the Hudson River. The dashing photographer is Eddie Cohen, a Russian immigrant who has run away from his father’s Lower East Side Orthodox community and his job as a tailor’s apprentice. When Eddie photographs the devastation on the streets of New York following the infamous Triangle Shirtwaist Factory fire, he becomes embroiled in the suspicious mystery behind a young woman’s disappearance and ignites the heart of Coralie” (Descriptive content provided by Syndetics). “Moving beyond pure biological understanding, Swaab presents a controversial and multilayered ethical argument surrounding the brain. Far from possessing true free will, Swaab argues, we have very little control over our everyday decisions, or who we will become, because our brains predetermine everything about us, long before we are born, from our moral character to our religious leanings to whom we fall in love with. And he challenges many of our prevailing assumptions about what makes us human, decoding the intricate “moral networks” that allow us to experience emotion, revealing maternal instinct to be the result of hormonal changes in the pregnant brain, and exploring the way that religious “imprinting” shapes the brain during childhood. Rife with memorable case studies, We Are Our Brains is already a bestselling international phenomenon. It aims to demystify the chemical and genetic workings of our most mysterious organ, in the process helping us to see who we are through an entirely new lens” (Descriptive content provided by Syndetics). “Lizzie Borden Took an Axe… When the assassination of Andrew J. Borden and Abbie D Borden, his wife, was announced, not only the people of Fall River and of Massachusetts, but the public throughout the country manifested the deepest interest in the affair. The murders soon became the theme of universal comment, both in public and private and every newspaper reference to the affair was read with eagerness digested and commented upon in a manner unprecedented. The crimes stand out in bold relief as the most atrocious, and at the same time, the most mystifying which the American public had ever before been called upon to discuss. They had about them that fascination of uncertainty, horrible though they were, which fixes the attention and holds it continually. Miss Lizzie A. Borden, a daughter of the murdered man, was arrested and charged with the killing. She was a young woman of hitherto spotless reputation and character, and more than that she was educated, refined and prominently connected with the work of the Christian church in Fall River. Her arrest added more and more to the interest which the public had taken in the matter. She was tried before the Superior Court of Massachusetts and a jury of her peers and found not guilty of the crimes. This event settled beyond question the probability of her guilt, and yet the case lost none of its absorbing interest. The author of this book therefore, has for a purpose the desire to give the reading public a connected story of the whole case, commencing with the day of the tragedy and ending with the day that Miss Borden was set free. Persons believing implicitly in the correctness of the findings of the jury at New Bedford will see much wrong done in those chapters which treat of the police work. But that the grand jury indicted the young lady is no fault of the author, and the story of what brought that indictment about is important, therefore it is given without prejudice. Harsh words were said of Miss Borden, but they came from those who had a sworn duty to perform, and they alone are responsible. Her defense is given as freely as the case of the prosecution, and with it the history is made as complete as was possible. The facts discussed came from official sources and are dependent upon the testimony submitted at the court trials. ” (Amazon). “Dead bodies are showing up in shallow graves on the empty construction lot of Vincent Plum Bail Bonds. No one is sure who the killer is, or why the victims have been offed, but what is clear is that Stephanie’s name is on the killer’s list. Short on time to find the murderer, Stephanie is also under pressure from family and friends to choose between her on-again-off-again boyfriend, Trenton cop Joe Morelli, and the bad boy in her life, security expert Ranger. Stephanie’s mom wants her to dump them both for a former high school football star who’s just returned to town. Stephanie’s sidekick, Lula, suggests a red-hot boudoir ‘bake-off.’ And Joe’s old-world grandmother gives Stephanie ‘the eye,’ which may mean that it’s time to get out of town. With a cold-blooded killer after her, a handful of hot men, and a capture list that includes a dancing bear and a senior citizen vampire, Stephanie’s life looks like it’s about to go up in smoke” (Descriptive content provided by Syndetics). “Anna is not sick, but she might as well be. By age thirteen, she has undergone countless surgeries, transfusions, and shots so that her older sister, Kate, can somehow fight the leukemia that has plagued her since childhood. The product of preimplantation genetic diagnosis, Anna was conceived as a bone marrow match for Kate—a life and a role that she has never challenged…until now. Like most teenagers, Anna is beginning to question who she truly is. But unlike most teenagers, she has always been defined in terms of her sister—and so Anna makes a decision that for most would be unthinkable, a decision that will tear her family apart and have perhaps fatal consequences for the sister she loves. My Sister’s Keeper examines what it means to be a good parent, a good sister, a good person. Is it morally correct to do whatever it takes to save a child’s life, even if that means infringing upon the rights of another? Is it worth trying to discover who you really are, if that quest makes you like yourself less? Should you follow your own heart, or let others lead you?” (Descriptive content provided by Syndetics). “Deborah Solomon, a biographer and art critic, draws on a wealth of unpublished letters and documents to explore the relationship between Rockwell’s despairing personality and his genius for reflecting America’s brightest hopes. ‘The thrill of his work,’ she writes, ‘is that he was able to use a commercial form [that of magazine illustration] to thrash out his private obsessions.’ In American Mirror, Solomon trains her perceptive eye not only on Rockwell and his art but on the development of visual journalism as it evolved from illustration in the 1920s to photography in the 1930s to television in the 1950s. She offers vivid cameos of the many famous Americans whom Rockwell counted as friends, including President Dwight Eisenhower, the folk artist Grandma Moses, the rock musician Al Kooper, and the generation of now-forgotten painters who ushered in the Golden Age of illustration, especially J. C. Leyendecker, the reclusive legend who created the Arrow Collar Man. Although derided by critics in his lifetime as a mere illustrator whose work could not compete with that of the Abstract Expressionists and other modern art movements, Rockwell has since attracted a passionate following in the art world. His faith in the power of storytelling puts his work in sync with the current art scene. American Mirror brilliantly explains why he deserves to be remembered as an American master of the first rank” (Descriptive content provided by Syndetics). 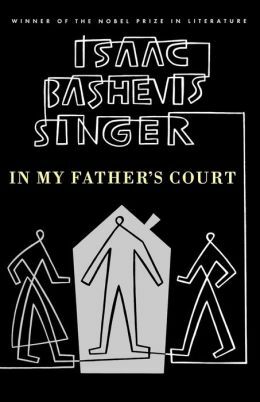 “Like Isaac Bashevis Singer’s fiction, this poignant memoir of his childhood in the household and rabbinical court of his father is full of spirits and demons, washerwomen and rabbis, beggars and rich men. This remembrance of Singer’s pious father, his rational yet adoring mother, and the never-ending parade of humanity that marched through their home is a portrait of a magnificent writer’s childhood self and of the world, now gone, that formed him” (Descriptive content provided by Syndetics). “Christmas is approaching, and in Québec it’s a time of dazzling snowfalls, bright lights, and gatherings with friends in front of blazing hearths. But shadows are falling on the usually festive season for Chief Inspector Armand Gamache. Most of his best agents have left the Homicide Department, his old friend and lieutenant Jean-Guy Beauvoir hasn’t spoken to him in months, and hostile forces are lining up against him. When Gamache receives a message from Myrna Landers that a longtime friend has failed to arrive for Christmas in the village of Three Pines, he welcomes the chance to get away from the city. Mystified by Myrna’s reluctance to reveal her friend’s name, Gamache soon discovers the missing woman was once one of the most famous people not just in North America, but in the world, and now goes unrecognized by virtually everyone except the mad, brilliant poet Ruth Zardo” (Descriptive content provided by Syndetics). “The sixteen exquisitely crafted stories in Island prove Alistair MacLeod to be a master. Quietly, precisely, he has created a body of work that is among the greatest to appear in English in the last fifty years. A book-besotted patriarch releases his only son from the obligations of the sea. A father provokes his young son to violence when he reluctantly sells the family horse. A passionate girl who grows up on a nearly deserted island turns into an ever-wistful woman when her one true love is felled by a logging accident. A dying young man listens to his grandmother play the old Gaelic songs on her ancient violin as they both fend off the inevitable. The events that propel MacLeod’s stories convince us of the importance of tradition, the beauty of the landscape, and the necessity of memory” (Descriptive content provided by Syndetics). “‘Do you remember the hospital, Colton?’ Sonja said. ‘Yes, mommy, I remember,’ he said. ‘That’s where the angels sang to me.’ When Colton Burpo made it through an emergency appendectomy, his family was overjoyed at his miraculous survival. What they weren’t expecting, though, was the story that emerged in the months that followed—a story as beautiful as it was extraordinary, detailing their little boy’s trip to heaven and back. Colton, not yet four years old, told his parents he left his body during the surgery–and authenticated that claim by describing exactly what his parents were doing in another part of the hospital while he was being operated on. He talked of visiting heaven and relayed stories told to him by people he met there whom he had never met in life, sharing events that happened even before he was born. He also astonished his parents with descriptions and obscure details about heaven that matched the Bible exactly, though he had not yet learned to read. With disarming innocence and the plainspoken boldness of a child, Colton tells of meeting long-departed family members. He describes Jesus, the angels, how ‘really, really big’ God is, and how much God loves us. Retold by his father, but using Colton’s uniquely simple words, Heaven is for Real offers a glimpse of the world that awaits us, where as Colton says, ‘Nobody is old and nobody wears glasses. '” (Descriptive content provided by Syndetics). “This is the first encyclopedic guide to the history of relations between Jews and Muslims around the world from the birth of Islam to today. Richly illustrated and beautifully produced, the book features more than 150 authoritative and accessible articles by an international team of leading experts in history, politics, literature, anthropology, and philosophy. Organized thematically and chronologically, this indispensable reference provides critical facts and balanced context for greater historical understanding and a more informed dialogue between Jews and Muslims. Part I covers the medieval period; Part II, the early modern period through the nineteenth century, in the Ottoman Empire, Africa, Asia, and Europe; Part III, the twentieth century, including the exile of Jews from the Muslim world, Jews and Muslims in Israel, and Jewish-Muslim politics; and Part IV, intersections between Jewish and Muslim origins, philosophy, scholarship, art, ritual, and beliefs. The main articles address major topics such as the Jews of Arabia at the origin of Islam; special profiles cover important individuals and places; and excerpts from primary sources provide contemporary views on historical events” (Descriptive content provided by Syndetics). “‘We are foolish, those of us who think we can escape the traps of aging,’ writes Tom DeBaggio. ‘I was one of them, dreaming of a perfect and healthy old age….Now, at fifty-eight, I realize the foolishness of my dreams as I watch my brain self-destruct from Alzheimer’s.’ Losing My Mind is DeBaggio’s extraordinary account of his early onset Alzheimer’s, a disease that ‘silently hollows the brain’ and slowly ‘gobbles memory and destroys life.’ But with DeBaggio’s curse came an unexpected blessing: the ability to chart the mechanics and musings of his failing mind. Whether describing the happy days of his youth or lamenting over the burden his disease has placed upon his loved ones, DeBaggio manages to inspire the reader with his ability to function, to think, and ultimately to survive. By turns an autobiography, a medical history, and a book of meditations, Losing My Mind is a testament to the splendor of memory and a triumphant celebration of the human spirit” (Descriptive content provided by Syndetics). “Noise of the World captures the world music scene through the eyes of the musicians who create it, all in their own words. Drawn from original interviews conducted over the last 20 years—with artists who left a massive musical legacy, like Nigeria’s Fela Anikulapo Kuti, and artists that continue to make crucial recordings, like Winston ‘Burning Spear’ Rodney—it will feature artists whose music has become part of the ‘mainstream,’ like the Gipsy Kings and Gloria Estefan and artists like Hugh Masakela and Miriam Makeba, who managed to cross over and garner that rarest of things, a pop hit, while retaining their roots, talking about making music in their native country and in exile. There is as much dissent between the artistic and holistic outlooks of Nigerian artists like Sunny Ade and Fela Anikulapo Kuti as there is between a religious rock band and a satanic metal band. These open and honest self-portraits will give music fans a greater appreciation of what is behind these sounds and the suffering these artists have endured and triumphs they have enjoyed” (Descriptive content provided by Syndetics). “They are not the students strolling across the bucolic liberal arts campuses where their grandfathers played football. They are first-generation college students—children of immigrants and blue-collar workers—who know that their hopes for success hinge on a degree. But college is expensive, unfamiliar, and intimidating. Inexperienced students expect tough classes and demanding, remote faculty. They may not know what an assignment means, what a score indicates, or that a single grade is not a definitive measure of ability. And they certainly dom’t feel entitled to be there. They do not presume success, and if they have a problem, they don’t expect to receive help or even a second chance. Rebecca D. Cox draws on five years of interviews and observations at community colleges. She shows how students and their instructors misunderstand and ultimately fail one another, despite good intentions. Most memorably, she describes how easily students can feel defeated—by their real-world responsibilities and by the demands of college—and come to conclude that they just don’t belong there after all. Eye-opening even for experienced faculty and administrators, The College Fear Factor reveals how the traditional college culture can actually pose obstacles to students’ success, and suggests strategies for effectively explaining academic expectations” (Descriptive content provided by Syndetics).